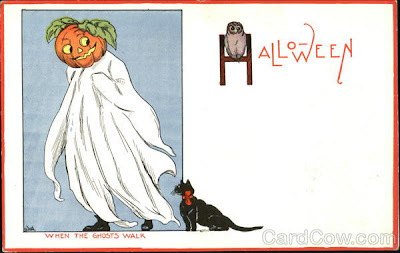 It's Halloween -- All Hallow's Eve. 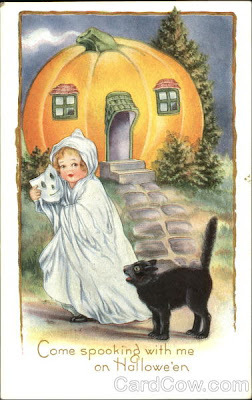 The secular event -- where children dress in costumes and come begging for candy has to be one of my favorite holidays! 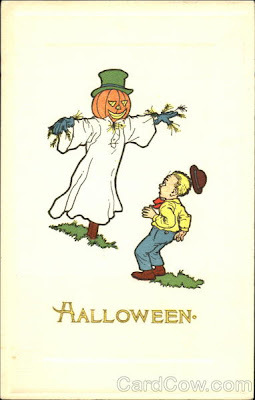 I've loved Halloween since I was a child. I loved to dress up -- and go from house to house with my brown grocery sack to hold all of my loot. 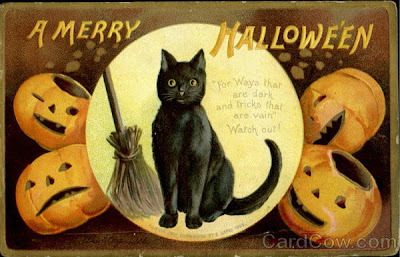 In my Trick or Treating Days, there were no miniature candy bars and into the sack went apples, homemade popcorn balls (some unwrapped which meant the other treats stuck to it), small paper Halloween bags of assorted candy and occasionally, just occasionally a full size candy bar. Coming home, my mother would put a sheet of the night's paper on the floor and we would dump out our back and eat from our treasure trove. Today will be spent making the portico into a "Witch's Lair". We'll hang a couple of lighted "ghosts" and put up some drippy cheesecloth. I'll carve a pumpkin and we've got two cement ones to light as well. 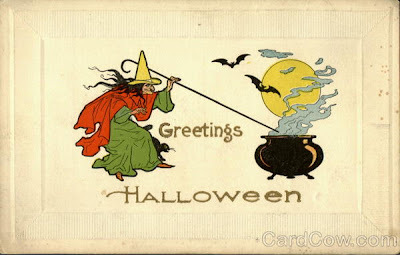 Come five oclock, dressed as a witch, I'll take my place in the lair and with my "cauldron" of candy bars -- full size candy bars. Because any child brave enough to enter the lair deserves a big candy bar. Dinner for me will be late although husband Jim will eat earlier. As traditional on Halloween as turkey is on Thanksgiving is the bowl of chili and pumpkin pie for dessert. A tradition started by my mother when my brother and I were small. A warm meal before we started out on the cold night. We liked it so well that we begged for chili the next year and alas, a tradition was born all those many years ago. My brother, too, still eats chili for Halloween as do I. Daughter Sarah has NEVER had anything but chili for Halloween. That scary witch at Linderhof will be me!!!! I would love to see your portico all done up. It sounds like you have a blast doing this. Chili is the perfect dish for tonight and I hope you have a fantastic evening! It is supposed to rain here, so hopefully my two kids won't want to be out for too long!